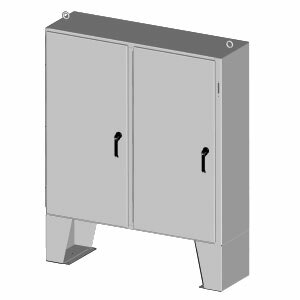 The SCE-XELLP Series two door indoor/ outdoor electrical enclosures are designed to house electrical and electronic controls, instruments and equipment in areas which may be regularly hosed down or are in very wet conditions. These electrical control panels provide protection from dust, dirt, oil and water. This outdoor electrical control panel is the solution for waterproof and weatherproof applications. The enclosures are extra deep for applications requiring more interior space. These enclosures are available in 0.125" thick carbon steel (0.104" thick door) with ANSI-61 gray powder coated inside and out. The sub-panels are powder coated white. The stainless steel models are available in 0.104" thick 304 or 316L stainless steel, with #4 brushed finish.